(hosted by Bruno Gerussi). It was later published in the 1975 book Celebrity Cooks Recipe Book: Volume One. If you have any other Pleasence recipes to share, please e-mail me. I would love to post them here! Make the fish stock, using the head & bones, etc. or an extra fillet. Put in a sauce pan, add a cup of water and simmer for 10 minutes. Strain. Season to taste. Put fillets in bottom of buttered earthenware baking dish. Sprinkle with finely chopped shallots and button mushrooms. Add enough wine to cover, and the fish stock. Now add the bouquet garni, bring to the boil, cover with a buttered paper, and bake in a moderate oven for 10 minutes. Drain off the liquid from the baking dish and add some more white wine, making the total wine used no more than 1 cup. Put this liquid in a sauce pan and keep warm. Make a Beurre Manie by kneading the flour and butter with fingers as though you were rubbing fine pastry. Form into small balls and add them to the liquid, stirring well. It will thicken. In another pan, saute the mushroom caps in oil and lemon juice. Pour sauce over the sole and decorate with the mushroom caps. Place under grill to brown lightly and glaze. Remove the bouquet garni before serving. Photo © 1975 INITIATIVE PRODUCTIONS LIMITED. All Rights Reserved. 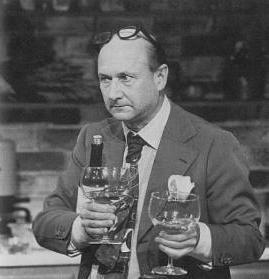 Recipe © 1975 Donald Pleasence / INITIATIVE PRODUCTIONS LIMITED. All Rights Reserved.